Medical peer-reviewed journal of research and practice “Oftalmologiceskie vedomosti” is published quarterly since 2008. 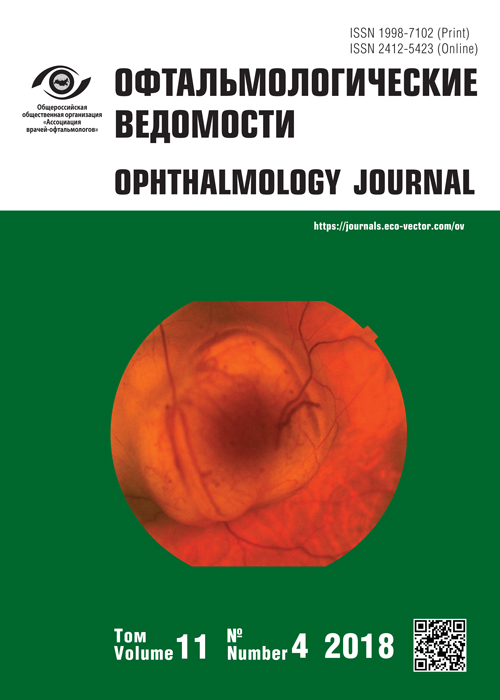 The journal is published under the aegis of the All-Russian Public Organization “Association of Ophthalmologists”. Astakhov Yury Sergeevich, M.D., Ph.D., professor, honorary doctor of the Pavlov First Saint Petersburg State Medical University. Main publications of the journal are focused on key issues of modern ophthalmology: etiology and pathogenesis, epidemiology, clinical picture features, up-to-date methods of diagnosis, prevention, and treatment of eye diseases and of those of its adnexa. The journal publishes original articles, scientific reviews, lectures, clinical case descriptions (presented by Russian and foreign authors), and informs about past congresses and conferences in Russia. The journal is oriented toward practicing ophthalmologists, including ophthalmic surgeons, scientific and teaching staff of medical higher educational institutions, physicians in ophthalmology training, as well as for specialists of allied health specialties. To provide for ophthalmologists of the Russian Federation actual and high quality research and practice insights into most up-to-date treatment and prevention methods of eye diseases and of those of its adnexa. “Oftalmologiceskie vedomosti” journal is included into the List of peer-reviewed scientific journals and reviews, in which main research results of theses for a doctor's and candidate’s degree ought to be published. The journal is registered by the Russian State Committee for Press and Mass Media on May 04, 2016 (Registration Number ПИ № ФС 77-65574). Tlish M.M., Kolesnikova N.V., Gyunter V.E., Steblyuk A.N., Marchenko E.S., Shavilova M.E., Tserkovnaya A.A.
Kulikov A.N., Sosnovskii S.V., Shamrey D.V., Remigin A.S., Alekperov S.I., Suetov A.A., Berezin R.D., Churashov S.V. Beletskaya I.S., Astakhov S.Y., Tkachenko N.V.
Shadrichev F.E., Grigor'eva N.N., Rozhdestvenskaya E.S. Budnikova E.A., Trufanov S.V., Rozinova V.N., Osipyan G.A., Mitichkina T.S., Makarova M.A. Sokolov V.O., Morozova N.V., Florentseva S.S., Veselov A.V., Morozov M.A. Saidasheva E.I., Biyanovskaya S.V., Kovshov F.V., Petrachkova M.S., Dolgova O.S., Levadnev Y.V. Skvortsova N.A., Zolnikova I.V., Ivanova M.E., Skvortsova Y.A. Riks I.A., Papanyan S.S., Astakhov S.Y., Dzhaliashvili G.Z.